Sabrina flies high in her latest comic book. The excellently gothic horror of Chilling Adventures of Sabrina might have just catapulted everyone’s favorite Teenage Witch to new highs because of its flashy Netflix adaptation, but Sabrina is returning to her less horrifying roots at Archie Comics, thanks to a new ongoing series that hearkens back to a time before the chills. Long before Roberto Aguirre-Sacasa and Robert Hack’s stellar Archie Horror series re-imagined Sabrina as a Satan-hailing wielder of the dark arts, the character was, just like the rest of her pals in Riverdale, the star of a more lighter range of comics. 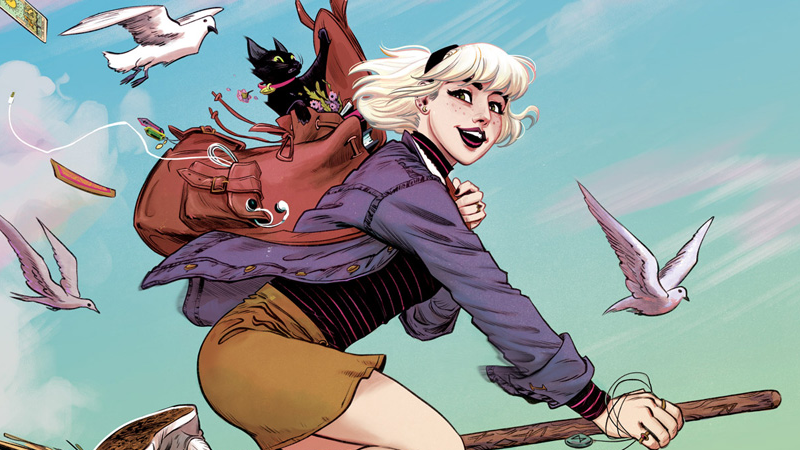 Sabrina Spellman has been bewitching comics readers since the ‘70s, and those roots are the ones being returned to in Kelly Thompson and Veronica Fish’s new five-part miniseries, simply titled Sabrina the Teenage Witch. Set in the neighboring town of Greendale (and in the modern rebooted Archie continuity, unlike Chilling), Sabrina will re-introduce us to the witchy world of Salem the cat and Sabrina’s aunts Hilda and Zelda, while also balancing it with Sabrina’s everyday life as a young schoolgirl, as she learns the lessons of not just teenage life, but life as supernatural protector, too. Fish’s character designs for Sabrina are just lovely. As delightful as Chilling is—whenever Aguirre-Sacasa can find the time to get back to writing it, between working on both Riverdale and Chilling’s Netflix adaptation—it’s cool to see Archie taking on a similar approach to the classic Sabrina as it did with the wildly successful modernization of Archie. These two versions of Sabrina can definitely co-exist—and hey, if you were expecting something a little more like the Melissa Joan Hart series when you first heard about a Sabrina Netflix series, only to find something altogether more creepy, maybe this new comic might be more up your alley. Sabrina the Teenage Witch is set to kick off March 27, 2019—with Archie Comics noting that if fans take to Thompson and Fish’s version of Sabrina, the series has the chance to evolve from a miniseries to a full ongoing comic.